We’d love your help. Let us know what’s wrong with this preview of Castle in the Air by Diana Wynne Jones. Far to the south of the land of Ingary, in the Sultanates of Rashpuht, there lived in the city of Zanzib a young and not very prosperous carpet dealer named Abdullah who loved to spend his time daydreaming. He was content with his life and his daydreams until, one day, a stranger sold him a magic carpet. To ask other readers questions about Castle in the Air, please sign up. I really want to read this, but I'm a huge Howl and Sophie fan. Are they actually in this? Or not really? Renette Not really. As you reach the end of the book the real identity of the soldier is revealed ! Another very readable book from DWJ, and one I've just finished reading to my daughter, Celyn. Refreshingly independent princesses being semi-saved by our devoted hero, a carpet salesman from the desert city of Zanzib. He's not hero material, and never resorts to violence, but he's a good fellow and carries the story well. We get all the standard Aladdin-esque trappings, a magic carpet, a genie in a bottle, evil djinns, bandits, sultans, camels... and for a while you think you know roughly where Another very readable book from DWJ, and one I've just finished reading to my daughter, Celyn. Refreshingly independent princesses being semi-saved by our devoted hero, a carpet salesman from the desert city of Zanzib. He's not hero material, and never resorts to violence, but he's a good fellow and carries the story well. We get all the standard Aladdin-esque trappings, a magic carpet, a genie in a bottle, evil djinns, bandits, sultans, camels... and for a while you think you know roughly where it's all heading. Then things veer northwards and we find ourselves treading old ground. Greener ground. Zeroing in on territory thoroughly trodden in book 1. You'll find yourself anticipating the reappearance of the Wizard Howl and Sophie. The ending was where things fell apart a little for me, and perhaps for Celyn judging by the somewhat bemused silence she greeted it with (she's non-verbal but normally makes her views known). In a frantic rush everything seems to turn into everything else - like the Scooby Doo mask-pulling finale ... on speed. Anyhow, it was good at the end to finally catch up with Sophie and Howl. We're moving onto the third book of the trilogy next - looking forward to it. "Castle in the Air" is Diana Wynne Jones' sequel to her amazingly awesome novel "Howl's Moving Castle." It was originally published in 1990 (four years after "Howl's Moving Castle"). At first glance, this novel doesn't sound like a sequel--it sounds more like a companion book at best--but I promise it does explain more about Howl and Sophie, just not right away and not, perhaps, in the most obvious way. 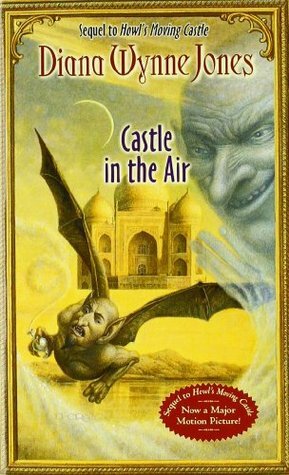 That said, this story is set in the Sultanates of Rashpuht a land far to the south of Ingary ( "Castle in the Air" is Diana Wynne Jones' sequel to her amazingly awesome novel "Howl's Moving Castle." It was originally published in 1990 (four years after "Howl's Moving Castle"). At first glance, this novel doesn't sound like a sequel--it sounds more like a companion book at best--but I promise it does explain more about Howl and Sophie, just not right away and not, perhaps, in the most obvious way. That said, this story is set in the Sultanates of Rashpuht a land far to the south of Ingary (where Howl and Sophie make their home). Instead of a land akin to King Arthur and Merlin, Rashpuht is much more likely to harbor Aladdin and other desert-dwellers. This change in setting, along with a new protagonist, make for the most dramatic differences between "Castle in the Air" and its predecessor. Abdullah works as a carpet merchant in the city of Zanzib. Abdullah's stall may not be as prosperous as his father's first wife's relatives would like, but Abdullah can't stand most of them so he doesn't worry too much. What really bothers Abdullah is the fact that he's selling carpets at all. Abdullah is convinced there is more to life and spends a good deal of his time daydreaming about what his life could be like if, say, he were a prince who had escaped bandits and disguised himself as a carpet merchant before he found his true love. All in all, the young man doesn't give his daydreams much thought until he is sold a mysterious carpet. With the carpet, Abdullah finds that all of his dreams seem to be coming true with alarming accuracy. Whisked to a magical garden, Abdullah meets and falls in love with the beautiful and intelligent Flower-in-the-Night only to have her abducted by an evil djinn. So begins Abdullah's adventure as he and his carpet set off to rescue his true love. This being a novel by Diana Wynne Jones, the plot is filled with charming twists and enjoyable characters throughout. The other great thing about this novel is how much Jones fleshes out the world she introduced in "Howl's Moving Castle." As the novel progresses, readers learn more about the relations between Ingary, Rashpuht, and Strangia (a land that becomes important later, trust me). At the same time, Jones also creates a completely new set of customs and even a new diction for her Rashpuhtian characters which gives the novel an impressive depth. "It is possible that my low and squalid establishment might provide that which you seek, O pearl of wanderers," he said, and cast his eye critically over the stranger's dirty desert robe, the corroded stud in the side of the man's nose, and his tattered headcloth as he said it. "It is worse than squalid, mighty seller of floor coverings," the stranger agreed. Exchanges like this appear throughout the novel and make it really enjoyable to read. At the same time this type of double talk suggests that Abdullah is a shrewder narrator than Sophie might have been at the start of the novel. Abdullah doesn't always know exactly what's going on during the novel, but he always tries to make sure he comes out on top (or at least not on a forty foot pole). 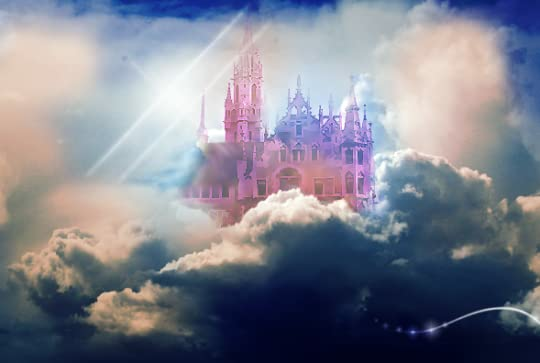 On its own, "Castle in the Air" is a lot of fun as far as fantasies go. Read in combination with "Howl's Moving Castle" and "House of Many Ways" (Jones' latest novel featuring Howl and Sophie due out in June 2008) this book is excellent. In this sequel to Howl's Moving Castle, the wizard Howl gets mixed up with djinni, genies (in this story they're two different species) and some Arabian Nights-type characters (from the sanitized version I read as a child). Abdullah, a humble young carpet merchant with big (day)dreams, is sold a magic carpet by a suspicious-looking stranger, which leads him to a beautiful princess named Flower-in-the-Night, a genie in a bottle, and other adventures. Abdullah is forced to leave behind his daydrea In this sequel to Howl's Moving Castle, the wizard Howl gets mixed up with djinni, genies (in this story they're two different species) and some Arabian Nights-type characters (from the sanitized version I read as a child). Abdullah, a humble young carpet merchant with big (day)dreams, is sold a magic carpet by a suspicious-looking stranger, which leads him to a beautiful princess named Flower-in-the-Night, a genie in a bottle, and other adventures. Abdullah is forced to leave behind his daydreams and take action when a djinn kidnaps Flower and takes her to his castle in the air to be one of his many wives. Eventually Abdullah's and Flower's story twines together with some of the main characters from Howl's Moving Castle. "O elegant tapestry of enchantment," Abdullah said, "O carpet composed of most complex cantrips, I pray you to move at a sedate speed toward Kingsbury, but to exercise the great wisdom woven in your fabric to make sure that we are not seen by anyone on the way." Obediently the carpet climbed through the mist. . . A hoarse and trembling voice said from the bottle, "Do you have to flatter it so disgustingly?" "This carpet," said Abdullah, "unlike you, is of an ensorcellment so pure and excellent that it will listen only to the finest of language. It is at heart a poet among carpets." A certain smugness spread through the pile of the carpet. It held its tattered edges proudly straight and sailed sweetly forward into the golden sunlight above the mist. Stil pripovedanja, ali i pisanja, je otprilike isti kao u prvom delu, i može se naslutiti kako će se roman završiti, kao i "prošlost" određenih magijskih predmeta ili likova. Jednostavno čitalac može da "nanjuši" sumnjivog lika ili sumnjiv predmet i da pretpostavi šta se u njemu krije. Terminar uma leitura sorrindo não tem preço. Não tinha dúvidas de que esse livro seria fantástico, assim como O Castelo Animado. A escrita da Diana é fora do comum. Ela sabe fazer com que a história brilhe e transborde magia. A forma como é escrito, parecendo quase uma fábula antiga, te imerge em um universo magnífico e deslumbrante, com personagens maravilhosos e completamente diferentes. Eu me apaixonei tudo de novo. Fiquei surpreso em me deparar com algumas coisas de O Castelo Animado — não ac Terminar uma leitura sorrindo não tem preço. Não tinha dúvidas de que esse livro seria fantástico, assim como O Castelo Animado. A escrita da Diana é fora do comum. Ela sabe fazer com que a história brilhe e transborde magia. A forma como é escrito, parecendo quase uma fábula antiga, te imerge em um universo magnífico e deslumbrante, com personagens maravilhosos e completamente diferentes. Eu me apaixonei tudo de novo. Fiquei surpreso em me deparar com algumas coisas de O Castelo Animado — não achei que teriam elementos ou se passaria no mesmo universo, então foi uma descoberta bacana. Ao mesmo tempo, toda essa temática de deserto, gênios, princesas e tapetes voadores me deixou encantado. Let's start with the important part. I did like this book. A lot. Now, if you don't like authors who play with our preconceive ideas of how stories and characters should work, you won't like this book as much as I did. Because that's how Wynne Jones build her stories, by playing with the understood to make it new. No, to matter at hand, my review: Castle in the Air is a companion book to Howl’s Moving Castle. It's the story of Abdullah, a young merchant from Zanzib. One day, a mysterious man sell Let's start with the important part. I did like this book. A lot. Now, if you don't like authors who play with our preconceive ideas of how stories and characters should work, you won't like this book as much as I did. Because that's how Wynne Jones build her stories, by playing with the understood to make it new. No, to matter at hand, my review: Castle in the Air is a companion book to Howl’s Moving Castle. It's the story of Abdullah, a young merchant from Zanzib. One day, a mysterious man sells him a magic carpet. The carpet, one of those inanimate objects that nonetheless seems to have a mind of its own, leads him into a lovely garden where he meets and falls in love with Princess Flower-in-the-Night, only to have her snatched by a djinn. Abdullah, then, sets off to rescue his love with the help of his magic carpet and the good head on his shoulders. Like in Howl's Moving castle, in this second book, Winne Jones impresses me by weaving together a story from what it seems are a series of random details, which significance only becomes evident as the plot advances. In this novel nothing is wasted, for every word, every scene, every character has is place and reason to be. Some help us see this new and unknown world while others give substance to the story. Wynne Jones plays with out expectations, giving us insta-love that while seemingly cliche in fact is there to show that falling in love is rather an excuse and not a reason to change our lives and go for an adventure. This review has been hidden because it contains spoilers. To view it, click here. Going back to reread one of favourite childhood authors has opened my eyes to some of the problematic aspects of Jones' writing. First of all, I tried to understand the story through Abdullah's narration. There is a possibility that he was not a reliable narrator, so Flower-in-the-Night's beauty could have been greatly exaggerated. Still, every chance he gets, he describes her astounding beauty--oh, and she's also clever to boot, so that's a bonus, but definitely not needed. It irritated me that Going back to reread one of favourite childhood authors has opened my eyes to some of the problematic aspects of Jones' writing. First of all, I tried to understand the story through Abdullah's narration. There is a possibility that he was not a reliable narrator, so Flower-in-the-Night's beauty could have been greatly exaggerated. Still, every chance he gets, he describes her astounding beauty--oh, and she's also clever to boot, so that's a bonus, but definitely not needed. It irritated me that they could fall in love so quickly--they knew each other for less than three days before they were married in a double wedding--under false pretenses. Abdullah only loved Flower for her beauty; Flower only loved Abdullah because he was the first man besides her father with whom she had made contact. Both of them were incredibly naive, having had no chance to get to know each other before they were married. When Flower was acting coldly towards Abdullah, I thought, "Great, the other princesses have educated her about her plans for a hasty elopement. Now she knows that Abdullah only valued her for her beauty and, while it was nice of him to come to her rescue, she certainly didn't need him." But, what happens instead? She acts all haughty because he didn't kiss her. Of all the things to get mad at him for--this scene was truly a giant face-palm. Speaking of hasty marriages, what was that scene between the soldier/Prince Justin and Princess Beatrice? He only chose her because she was one of the least attractive people in the room and she "looked like she could mend his clothes"? Who agrees to this kind of marriage proposal? Oh, Princess Beatrice of course. Again, two characters who do not know each other at all somehow end up together because the woman is naive enough to comply. I guess what I'm working towards is that the females in this world are so weakly written that they become part of the landscape rather than characters themselves. The women do nothing but clean (Sophie in the first book), cook (Martha), sew (Princess Beatrice), and have babies (almost all of the Hatters immediately after the events of Howl's Moving Castle). While there's nothing wrong to choose these lives for themselves, I felt it a great injustice to have their heroism taken away by men with magic. Sophie, a great magician herself, must rely on the Wizard Sulliman, Howl, Abdullah, the soldier, etc. to save her. Clever and logical Flower had to wait around for Abdullah to rescue her. Even Lettie, Sophie's strong-willed sister, was made to kept her powers secret because "Ben doesn't like people to know that I can do magic". The only thing worse than their constantly getting overshadowed is the fact that the men view nothing wrong with this. Abdullah doesn't like Sophie for being strong-willed. He views this trait--as well as other traits like being fat--to be undesirable in women. And, of course, he is right, for the two "fat, ugly girls" that he was nearly "forced" into marrying are vain and stupid--just as he predicted--and have no problem spending the rest of eternity in exile with an immature and spoiled djinn. Great. What an strong message for young girls who read this story. Le había puesto tres estrellas de primero, pero me lo he pensado y he cambiado a dos porque el machismo que impregna esta historia no me dejaba disfrutar de ella. El castillo ambulante es uno de mis libros favoritos, y toparme ahora con ESTO, de verdad que no lo entiendo. Aunque no continúa la historia como tal después de El castillo ambulante, sí aparecen sus personajes allá por el último tercio del libro. Pero, vamos, para lo que hacen, mejor que no los hubiese metido en la historia, porque est Le había puesto tres estrellas de primero, pero me lo he pensado y he cambiado a dos porque el machismo que impregna esta historia no me dejaba disfrutar de ella. El castillo ambulante es uno de mis libros favoritos, y toparme ahora con ESTO, de verdad que no lo entiendo. Aunque no continúa la historia como tal después de El castillo ambulante, sí aparecen sus personajes allá por el último tercio del libro. Pero, vamos, para lo que hacen, mejor que no los hubiese metido en la historia, porque están irreconocibles. Yo no sé si es porque la autora situa la acción en otra cultura que no es la suya y eso le da la excusa perfecta para desatar su racismo y machismo. El amor a primera vista, el tratar a las mujeres como objetos de los que los hombres pueden apropiarse en cualquier momento, tratarlas de inútiles (a no ser que se dediquen a cuidar críos), el presentar a la religión musulmana como inferior y machista cuando en Ingary están igual... En serio, yo flipaba con cada página que pasaba. Pensaba que con la aparición de Sophie se arreglaría, pero NOPE, fue a peor. En serio, le he dado dos estrellas porque me gusta mucho la autora (y porque hay un personaje que se llama Beatrice, así de tonta soy) y ha habido momentos que he podido disfrutar del libro y he conseguido engancharme, pero es que es tan jodidamente machista que casi lo quemo. Castle in the Air is the sequel to Howl’s Moving Castle. That being said I picked this up with trepidation because I was rather disappointed the book wasn’t going to be from the main characters in the first, nor would it have a direct focus on it. But they do occur later on. That being said, I loved this book! I loved how she managed to turn this into another one of her witty, light-hearted, but not lacking in depth, fantasy tales. It was unique, original, and if I hadn’t read spoilers beforehand Castle in the Air is the sequel to Howl’s Moving Castle. That being said I picked this up with trepidation because I was rather disappointed the book wasn’t going to be from the main characters in the first, nor would it have a direct focus on it. But they do occur later on. That being said, I loved this book! I loved how she managed to turn this into another one of her witty, light-hearted, but not lacking in depth, fantasy tales. It was unique, original, and if I hadn’t read spoilers beforehand I would have been quite shocked at the twist at the end. It was quite ingenious how she managed to trick us throughout the whole book. Her descriptions and writing were fabulous as always, and she never manages to fall into the cliché. “Fate doesn't care most of the time. Okay, I have to admit, I pick this book up thinking only about Howl and ended up being indifferent in new characters' fates, but the story itself and the writing (especially Russian translation) were super funny and smart, plus old heroes had played their roles, so overall I'm happy and ready for more. This installment's adventures start in Zanzib where we meet Abdullah who sells carpets and loves to dream. One day a stranger offers him an old magical item which soon changes the boy's life: he falls in love, but his sweetheart gets abducted and Abdullah has to save not only her, but his own life too. Danger is everywhere, but with a flying carpet, a nasty jinn, a skillful solder and a few crazy cats the boy will go to Ingary and become a hero. In this part we'll see Howl and Sophie, Lettie and her husband (until this book I wasn't sure whom she will marry: prince or mage), little Valeria, Calcifer and others. It's been only a year since the ending of the book #1, but there are serious news about everyone. Howl and Sophie now one of my favorite pairings. They aren't your typical HEA-couple, their quarrel, they fight, they know each other's flaws and don't mind them at all, 'cause you can't love a person partially, only whole. I'd love to see these two in a more mature setting, it might be firework-ish! Again, I wanna praise the plot. So many different lines interlace and turn into a well-thought-out and logical netting. Silly and naive moments open up from another side, as well as characters' natures and motivations. And after you've done with the book you wanna re-read it again, 'cause so many things will be different now when you know every secret and twist. That's magic! Diana Wynne Jones knows how to surprise and entertain her readers during their read. I wasn't bored even once. I also need to highlight Jones's wits and humor (and many thanks to the Russian translator who did GREAT). I might not be in love with the new narrator, but I did enjoy his way of thoughts and speech. I can't say more, 'cause this book is too intricate not to give a spoiler away by touching its threads. So I just let a content sigh out and run for the book #3. 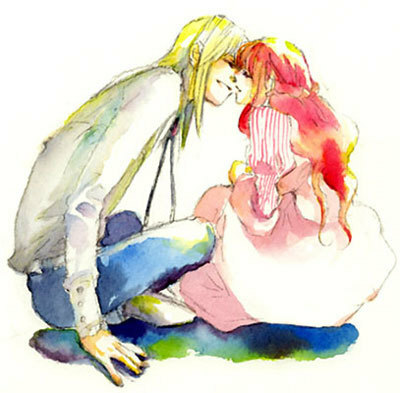 I won't ever get tired of Howl and Sophie, even if there's not very much of them here. Still, a fun and enjoyable book! Una vera e propria fiaba che mette di buonumore (dovrebbe essere prescritta come medicina). Loved it. Even better than the preceding volume (which I did enjoy), because everything I disliked about Howl's Moving Castle was fixed herein. Una descripción hermosa de los escenarios. Incluso poética. Un excelente y original libro de fantasía. If you read and enjoyed Howl's Moving Castle and have yet to read this, what are you waiting for? Come on now, go read it. At once. 1. The plot makes more sense on a first read-- there's a clear mission from the get-go, and the reveals at the end aren't at all confusing. 2. It's not exactly a retelling... but there are clear, surely intended parallels to the story of Aladdin. I really liked the If you read and enjoyed Howl's Moving Castle and have yet to read this, what are you waiting for? Come on now, go read it. At once. 2. It's not exactly a retelling... but there are clear, surely intended parallels to the story of Aladdin. I really liked the setting, which was a fantasy version of Arabia. "O most excellent of carpets," he said, "O brightest-colored and most delicately woven, whose lovely textile is so cunningly enhanced with magic, I fear I have not treated you hitherto with proper respect. I have snapped commands and even shouted at you, where I now see that your gentle nature requires only the mildest of requests. Forgive, oh, forgive!" Oh, yeah, that's right. In case the Aladdin thing didn't clue you in, there is a MAGIC CARPET. And a GENIE. If this doesn't appeal to you, I can't even begin to understand your strange, strange mind. MAGIC CARPET! GENIE! It's hard to think of anything negative to say about this one. There were a couple typos? I guess the reason it didn't get five stars from me is that 1. I'm stubbornly miserly in giving away my precious, precious stars, and 2. Even though I enjoyed every second of it (Every. Single. Second. ), the writing style was a tad detached, so I didn't quite get the emotional depth that I require for five stars. Castle in the Air is indeed a companion to Howl's Moving Castle, but the first thing to accept is that you won't be seeing much of Howl and Sophie. Once I did that, I was able to relax and enjoy this entirely different book. Abdullah is from Rashpuht, and this is where the story begins. As the names suggest, there's a definite "Arabian Nights" flavor to the narrative. Abdullah finds himself with a magic carpet, that he doesn't know how to control, exactly, and meets with the princess Flowers-in-t Castle in the Air is indeed a companion to Howl's Moving Castle, but the first thing to accept is that you won't be seeing much of Howl and Sophie. Once I did that, I was able to relax and enjoy this entirely different book. Abdullah is from Rashpuht, and this is where the story begins. As the names suggest, there's a definite "Arabian Nights" flavor to the narrative. Abdullah finds himself with a magic carpet, that he doesn't know how to control, exactly, and meets with the princess Flowers-in-the-Night. Who is kidnapped right in front of him by an evil djinn. And so Abdullah goes on a quest to rescue his beloved, which eventually brings him to Ingary, and into contact with characters from the previous book. There's some really fantastic characters in here. Abdullah himself, who is a smooth talker but quite sincere in his love for Flowers-in-the-Night. Flowers-in-the-Night herself, who isn't content to be in distress and who is as intelligent as she is beautiful. And Princess Beatrice in particular, though she isn't in much of the book. Not as good as Howl's Moving Castle, but a very entertaining story. this book was really good! it was funny and had all of hte great characters from Howl's Moving Castle along with a few new and very entertaining characters. there were some plot twists along with curses and disguises. it had a great ending with many surprises. so all in all, the perfect book. Inizialmente ero intenzionato a dire che questo libro mi era piaciuto più del suo predecessore, nonostante la mancanza di un collegamento (il fantomatico castello qui ha il ruolo di mera comparsa), poi però l’ho finito e mi sono dovuto ricredere. Non mi è piaciuto né più né meno del primo, e proprio per colpa della presenza di tale collegamento. Peccato. Here we have a story of a carpet-seller Abdullah who wants to marry a Princess, finds a magic carpet, a genie, a motley-crew of friends and goes about trying to rescue the Princess from a powerful Djinn. It is great fun and would suit middle-grade audiences as well as those *ahem* my age. Many years ago I went to an outdoor cinema that happened to be playing Howl's Moving Castle. I had no idea what to expect, no idea that it was based on a book, and I fell in love with it. Which led me to eventua Here we have a story of a carpet-seller Abdullah who wants to marry a Princess, finds a magic carpet, a genie, a motley-crew of friends and goes about trying to rescue the Princess from a powerful Djinn. It is great fun and would suit middle-grade audiences as well as those *ahem* my age. One of the marks of my favorite authors is their ability to keep me guessing–the knowledge that when I crack open one of their books, I should expect the unexpected. This is only my second Diana Wynne Jones read, but I can already see her name rising in the ranks of the authors who do just that. Like Howl’s Moving Castle, Castle in the Air is an incredibly smart, adventurous, twisting read that is a credit to readers of all ages. At no point did I know where the story was going, and in the end I One of the marks of my favorite authors is their ability to keep me guessing–the knowledge that when I crack open one of their books, I should expect the unexpected. This is only my second Diana Wynne Jones read, but I can already see her name rising in the ranks of the authors who do just that. Like Howl’s Moving Castle, Castle in the Air is an incredibly smart, adventurous, twisting read that is a credit to readers of all ages. At no point did I know where the story was going, and in the end I was so incredibly happy to see how it all ironed out, I can hardly wait to see some of my favorite characters back in House of Many Ways! Now, all of those twists and turns have a major drawback in the reviewing front in that it’s difficult to talk about a lot of the story in Castle in the Air without spoiling some things, so I’m going to be careful and brief! Abdullah as a main character provides an interested change of pace. Not only do we shift to the male point of view, but we also have a massive cultural shift in Castle in the Air. Somewhat of a more respectable Aladdin character, Abdullah is a hard-working, respectful carpet merchant rather bored with his current state of existence. Well, you know what they say, “May your life be interesting” is as much a curse as it is a blessing, and Abdullah’s life certainly takes a turn for the interesting in these pages. His cultural upbringing, far from the headstrong hills of Ingary, dictates that he speak in the most flattering and luminescent terms possible, also makes him a little unused to strong minded women (of which Castle in the Air has no shortage), and an expert at placating argumentative companions. Harnessed with a persnickety magic carpet, a somewhat vile genie, a soldier who looks trustworthy while awake, and most devious while sleeping, and a pair of most unusual cats, Abdullah is bent on rescuing his love and fulfilling the prophecies that were made at their births. While I did greatly enjoy Castle in the Air, I’m sad to say that my enjoyment did not come near that which I had for Howl’s Moving Castle. I appreciated that Abdullah was a completely different character from those we dealt with previously, but still what I loved so much about the first book were the characters Howl, Sophie, and Calcifer. For some reason, I’ve also never enjoyed the Arabian folklore as much, and I was somewhat confused by the presence of both a genie and djinn in this book. It was always my understanding that the word ‘genie’ was the American vernacular of the term ‘djinn’, but it would seem that in Castle in the Air they have completely different identities and mythologies entirely! The genie is a creature tied to a bottle that is required to grant wishes to their master–very similar to the popularized notions we’re accustomed to from pop culture like Disney’s Aladdin or the old TV series I Dream of Jeannie. The djinn, however, are more powerful beings that have no such ties, and from what I have read seem much closer to the creatures in Arabian mythology. If anyone has any more info/has read any good explanation of this, please let me know! Also, Ana of The Booksmugglers pointed out in a recent review Diana Wynne Jones’ perchance for writing very negatively of fat people. You know the glass shattering episode of How I Met Your Mother? Yep. I notice this now, and Castle in the Air was no exception, though I’m sure I would not have noticed it if it hadn’t been pointed out to me. We see this in the women Abdullah’s father’s first wive’s brother’s daughter Fatima (yep, you read that right) wants Abdullah to marry. Also, there was a point that made me uncomfortable where they slap a child to get her to stop crying, and recommend this sort of abusive behavior. Al principio del libro la historia me estaba gustando pero no me acababa de convencer, me hacía gracia la alfombra, el genio me caía super bien, los gatitos, pero no conseguía conectar con Abdullah ni el soldado. Toda la historia de Flor-en-la-noche me estaba pareciendo un poquitín empalagosilla y deseaba que pasasen más cosas. Pero cual fue mi sorpresa cuando se va descubriendo poco a poco (view spoiler)[que Sophie es uno de los gatitos, que el castillo donde están las princesas cautivas es el c Al principio del libro la historia me estaba gustando pero no me acababa de convencer, me hacía gracia la alfombra, el genio me caía super bien, los gatitos, pero no conseguía conectar con Abdullah ni el soldado. Toda la historia de Flor-en-la-noche me estaba pareciendo un poquitín empalagosilla y deseaba que pasasen más cosas. Pero cual fue mi sorpresa cuando se va descubriendo poco a poco (view spoiler)[que Sophie es uno de los gatitos, que el castillo donde están las princesas cautivas es el castillo ambulante y sobre todo cuando Howl resulta ser el genio y Calcifer la alfombra!!!! Como me ha gustado volver a reencontrarme con ellos. I thought this was really fun read, just slightly more than Howl's Moving Castle, which I was surprised by! The main character in this one, Abdullah, speaks in the most ridiculous, flowery way, and I loved it! I can see why people might get bored of it after a while, but I continued to find it very charming. Probably my main issue was Abdullah equating slimness with beauty, and of course the whole insta-love thing between him and Flower-in-the-Night (what a name...). I was so intrigued to find o I thought this was really fun read, just slightly more than Howl's Moving Castle, which I was surprised by! The main character in this one, Abdullah, speaks in the most ridiculous, flowery way, and I loved it! I can see why people might get bored of it after a while, but I continued to find it very charming. Probably my main issue was Abdullah equating slimness with beauty, and of course the whole insta-love thing between him and Flower-in-the-Night (what a name...). I was so intrigued to find out how exactly this is a sequel to Howl's Moving Castle though, and I really liked how that was revealed! Мені сподобалося навіть більше за Ходячий замок Хаула, чарівно й невимушено. El argumento, si nos fijamos bien, tiene un cierto toque de Las mil y una noches que le diferencia claramente de EL CASTILLO AMBULANTE. Y es que, si lo que esperas es encontrarte una continuación, aquí no la encontrarás. Casi podríamos decir que es un libro aparte. Así, nos encontramos siendo testigos de las aventuras (¿o quizá desventuras?) de Abdullah por encontrar a su amadísima y bellísima Flor-en-la-noche. Tengo que decir que ambos me han encantado. Uno por su fuerza y sus ganas de conseguir El argumento, si nos fijamos bien, tiene un cierto toque de Las mil y una noches que le diferencia claramente de EL CASTILLO AMBULANTE. Y es que, si lo que esperas es encontrarte una continuación, aquí no la encontrarás. Casi podríamos decir que es un libro aparte. Así, nos encontramos siendo testigos de las aventuras (¿o quizá desventuras?) de Abdullah por encontrar a su amadísima y bellísima Flor-en-la-noche. Tengo que decir que ambos me han encantado. Uno por su fuerza y sus ganas de conseguir su objetivo (aunque tanto tratamiento de respeto podrían llevarte a un ataque de nervios si no fuese por lo humorísticamente bien que están hechos) y la otra por su testarudez e inteligencia, que la sacarán adelante. También son muy destacables los demás personajes, pero no los nombraré; eso sería un señor spoiler, y no se puede arruinar un libro tan genial así. En cuanto a la forma de escribir... marca especial de Diana Wynne Jones, capaz de hacer que un libro de fantasía tome la forma de una historia de cuento, tan mágicas y maravillosas como las que leíamos cuando éramos pequeños y aún así hacer que nos maravillemos y sorprendamos. Sinceramente mi ha spiazzato e non in modo positivo. Io pensavo che fosse in tutto e per tutto un sequel, anche se venivano presentati nuovi personaggi, nuove storie, che la presenza di Howl e Sophie fosse sicura e persistente. Invece no! Il mio adorato Howl si presenta quasi alla fine, in modo si bizzarro, come sua abitudine, ma per niente significativo! Mi sono sentita quasi tradita! Ammetto che possa sembrare una cosa estremamente emotiva, ma così è stato… presa dalla massima delusione, non m Sinceramente mi ha spiazzato e non in modo positivo. Mi sono sentita quasi tradita! Ammetto che possa sembrare una cosa estremamente emotiva, ma così è stato… presa dalla massima delusione, non mi sono goduta affatto le avventure di Abdullah. E pur essendo un personaggio simpatico lui stesso, non mi sono affezionata alla sua storia, in alcuni punti la narrazione poi è molto lenta. Il fatto di star leggendo un libro della Jones ed essere pienamente consapevole di non apprezzarlo a pieno mi ha un po’ scosso. Non è un libro pessimo, è simpatico e gioioso. La presenza di Sophie e il finale, tipicamente alla Howl e con un colpo di scena, che fortunatamente mi ha rallegrato e lasciato a bocca aperta, hanno salvato il tutto dalla bocciatura totale. This as a great spin off to Howl's Moving Castle. While Howl and Sophie aren't main characters you will see them at small points throughout the story. This story felt like a fun retelling of Arabian Nights/Aladdin. I connected with Abdullah quickly and loved how much of his life we learn about before he meets the princess. The way he finds the flying carpet is so well written and the story is just a fun read. (3.5 stars) Not as good as Howl’s Moving Castle, but enjoyable. I don't know what else to say about it, possibly because listening to it on audiobook means I started it so long ago. I missed Howl and Sophie and Calcifer, and felt that this book had a little less of the inherent charm Moving Castle had, though it has its own humor (especially the genie).